 Organ is a Midlands born and based British contemporary art photographer. He is a Licentiate of the Royal Photographic Society whose work has been published by their Contemporary Journal. Having been a photographic student of six years with Coventry’s highly respected City College, Alan is qualified to high professional (HNC) standards, making him equally at home in the studio or on location. His particular interests have included the study of photographic history from where he claims to have been influenced and amazed by a diverse mix-up of many great names from the past and present including Eugene Atget, Ansel Adams, Andre Kertesz, David Bailey and Paul Graham. His work has been exhibited at several venues including his ‘Immersion’ Exhibition at the CET building (2018) and the showing of his “Their Pictures of Me” project at the prestigious Herbert Art Gallery in 2012 and “I Hate Fruit” in 2014. Alan, who has submitted works to the Royal Academy of Arts, is regularly on the look-out for commissions, ideas, assignments, publishing opportunities, invitations to exhibit and collaborative projects. If interested in pursuing any such opportunities with Alan or if you would like to purchase his existing work, the appropriate links can be found on this page.